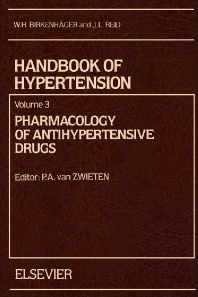 Handbook of Hypertension, Volume 3: Pharmacology of Antihypertensive Drugs presents the biological and clinical knowledge in the field of hypertension. This book discusses the fundamental pharmacology of antihypertensive drugs. Organized into 12 chapters, this volume begins with an overview of the classification of antihypertensive mechanisms of drugs. This text then examines the effects of antihypertensive drugs in animal models and discusses the importance of these models and responses to human hypertension. Other chapters consider the pharmacological basis for the treatment of hypertension. This book discusses as well the various classes of antihypertensive drugs, which depends on two factors. The final chapter deals with the inhibitors of angiotensin-converting enzyme, which are essential in the drug treatment of hypertensive disease. This book is a valuable resource for clinicians, pharmacists, physiologists, epidemiologists, biological scientists, and general practitioners. Clinical investigators and medical students will also find this book extremely useful.